Bernholz’s music has touched on dark themes before. The 2014 Gazelle Twin album, UNFLESH, has been described as a visceral depiction of puberty, phobia and gender identity – told through a spectrum of choral voices and spoken word, backed by unrelenting electronic production. Her 2016 performance project Kingdom Come, explored tribalism, social conditioning and fascism in the contemporary suburban and consumer landscape. Her latest work, Pastoral, was made against the backdrop of the Brexit campaigns and referendum – a period of intense and vocal debate about, among other things, who and what is English. Befitting the theme of discord around ideas of national identity, the album conjures up a highly original sound world full of references to England’s idealized past – as seen through the distorted perspective of the present. Within this, Bernholz takes on the role of a 21st Century court jester, satirizing the disturbing platitudes of re-emergent populism through her extraordinary array of voice registers, textures and treatments. Speaking with us recently, Bernholz described her approach to the vocal production on Pastoral: “Most of the album features spoken word, and I tend to treat vocals according to the mood of the song. So on the spoken stuff, the vocals are multi-tracked, in usually 4-5 layers with each one at a slightly different pitch. I like to equalise genders in my production and also experiment with the idea of a ‘chorus’ of voices. I tend to do this manually using very basic panning and pitching up or down to suggest that space and multiple genders. The voices on Pastoral are only part of the picture; equally arresting is the overall sound design Bernholz came up with. Juxtaposing, brash, hyper-contemporary drum machine and synth sounds with the distinctly pre-modern flavor of flute-like recorders, harpsichords, and flourishes of orchestral strings, the album seems to take place in some kind of medieval future full of strange harmonies and dissonances. As she explains, this particular combination was absolutely deliberate. “I was initially playing with sampled recorder, pieces of early music which I loved and then wanted to see how these could work to hint at an era, but remain relevant to the record – i.e., a record being made in 2018. I almost exclusively work with samples, found or ones I’ve created. I use whatever I have to hand. For this album I made sure I was going to use a range of cheap plastic recorders, treble and descant, stuff I’ve always had since being a kid, as well as bells, tambourines and other folky sounding bits of percussion. As is the case with many electronic musicians who work with samples, developing a sound palette segues directly into the composition and arrangement process, as Bernholz explains: “On this album I think often let the natural rhythms of looped samples direct the rest - you can really hear that in ‘Folly’, ‘Throne’, ‘Mongrel’ etc. – so the tempos, the beats, the basslines and then the rest all fall into place when I feel I’ve hit on a good loop. As jarring a listening experience as Pastoral is, it nevertheless has an overall aesthetic unity – clearly conceived as an album rather than a collection of tracks. 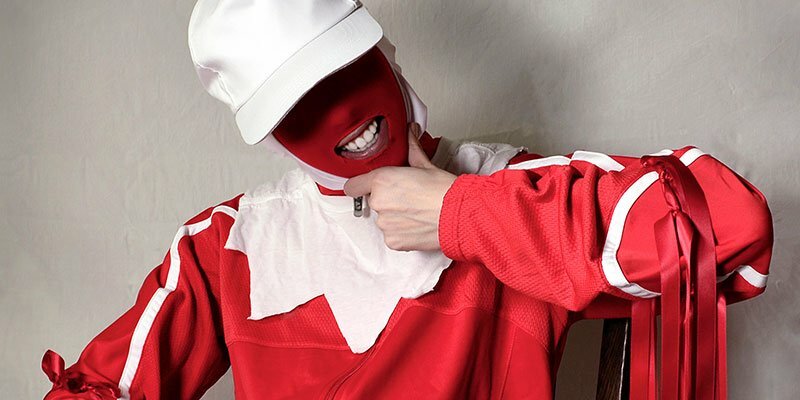 Always mindful of Gazelle Twin’s visual and performative presentation, Bernholz came up with an ideal personification of the album’s music and lyrics in the figure of the Jester – the red and white clad joker that features prominently in the album’s artwork, videos, and live show. “The Jester was the perfect character to embody lots of different voices, of multiple genders, ages and clichés. The whole album is in the spirit of sarcasm and mockery, and so the Jester was an essential part of that from the very beginning. When I first started writing the album I was thinking about those everyday voices I mentioned earlier, and the movements it forces you to do with your body, and facial expressions it invokes, it just felt like I was a puppet or comic performer.